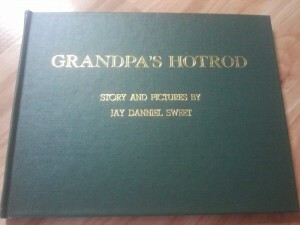 Written and illustrated by Jay Danniel Sweet. 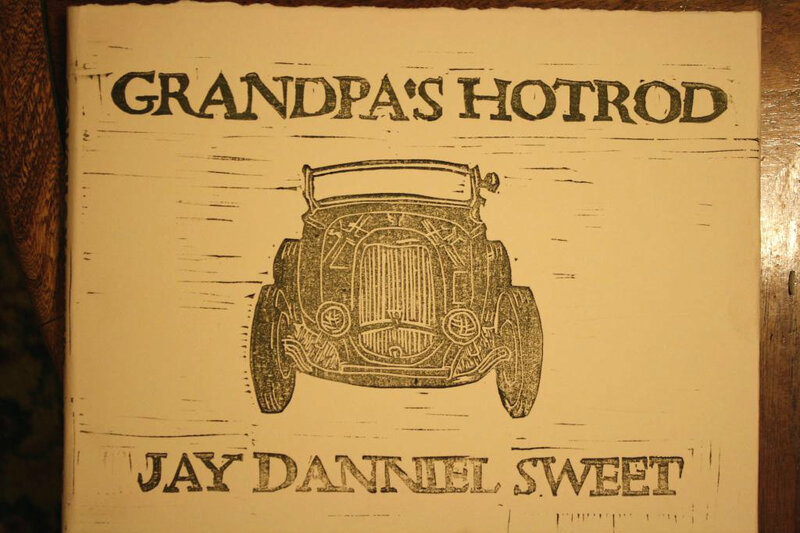 Grandpa’s Hotrod is a children’s book I wrote a few years ago. It took me a long time to get the book produced, but I think the finished product is really nice. 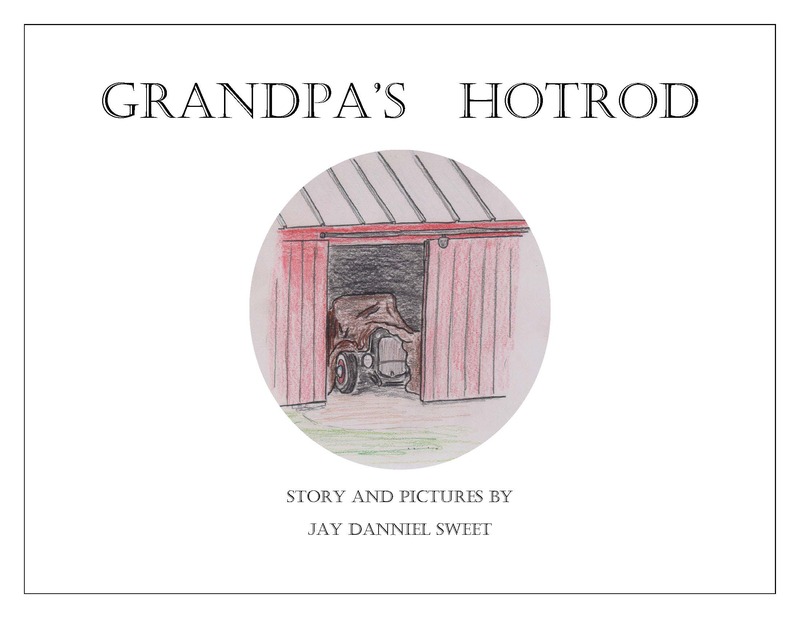 I wanted the book to be something parents could read to their children and grandparents could read to their grandchildren many times. 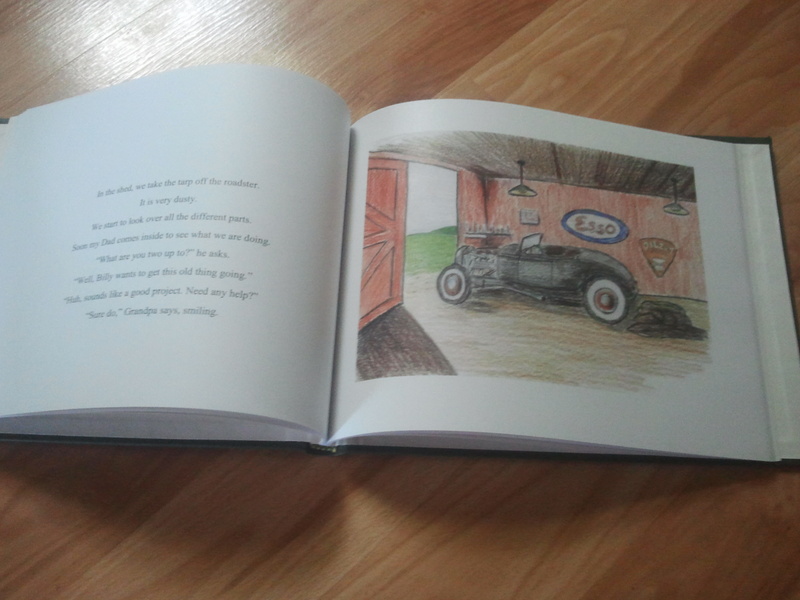 I also wanted it to be enjoyable for a young reader to read themselves and learn through the illustrations. 50 pages, about 1/2 text and 1/2 illustrations. 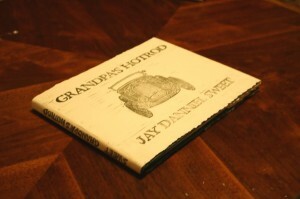 The book is printed in Wichita Kansas and sewn bound in Denver Colorado USA. I am very lucky to have such high quality companies so close in proximity that together produce a top-notch heirloom quality book that will last for a lifetime. The jacket was designed and printed in America by noted artist and celebrity Mark “general gow” Phelan. 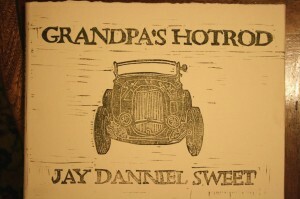 Hand carved and printed in his secret studio on top quality paper. Just click on “Order Page” on the black header above. I will ship out your book the next day via USPS priority mail, so you will get it in 2-3 business days. Also- if you would like me to sign or personalize your copy, please let me know in the comments section on the paypal payment “message to seller” section. 8 Responses to "Grandpa’s Hotrod"
I’m so excited, it’s been a long time coming!! Congratulations!! How do I get a copy? want one also autographed love it !!!!! actually need 4!! I wanted to let you know that Jake (7), Ella (5) and I love the book! EXCELLENT JOB, my friend. Well written, illustrated and great story that many of us can relate to. 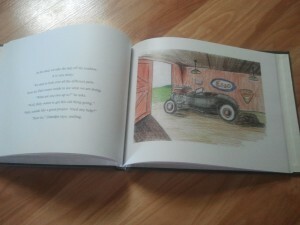 It’s very much on level for children of parents who have old hotrods in the shed and those that dream of them! This totally made our evening and they love it!! We may just have to throw away our copy of “The NIght Before Christmas”, and start a new, family tradition of reading, “Grandpa’s Hotrod”, Christmas Eve instead! 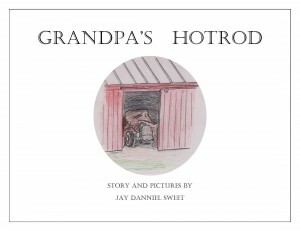 I saw a mention of your book on the HAMB and would like a copy for my grandsons. Could you let me know how much the postage to England will be and what the Paypal account is. ps. I own Chris Swenson’s old patina’d 46 pickup. Ok, now I see what you’ve been up to. Are you going to have copies at this year’s BBQ?